Langley with Hardley is a large parish in the southeast of the county in the South Norfolk District. The parish contains two ecclesiastical parishes – Langley and Hardley. The north parish boundary runs along the River Yare and much of the parish is drained marshland. Langley derives from Old English and means ’long wood or clearing’. Hardley is also Old English meaning ‘hard clearing’. Land in both villages is mentioned in the Domesday Book. Land at Langley was held by Anand under King Edward before 1066. Unfortunately Anand died ‘a sudden death’. After 1066 Bishop William held the manor. The monks of St Benedict at Holme owned land at Hardley. The documentary record suggests the settlements were formed during the Saxon period. The archaeology of the parish, however, reveals that there was activity here much earlier. The earliest recorded finds are two Palaeolithic handaxes (NHER 10339 and 10362). A Palaeolithic flake (NHER 19192) has also been recovered. A Neolithic pit (NHER 35842) has been excavated. Several Neolithic axeheads (NHER 10341,10342 and 10343) and a Neolithic to Bronze Age stone axe hammer (NHER 10340) have also been found. Complex cropmarks of a Bronze Age landscape (NHER 17291), including field systems, barrows and a possible Bronze Age or Neolithic henge, can also be seen on aerial photographs. Bronze Age ring ditches (NHER 17583 and 19406) have also been identified on two other sites. A Bronze Age copper alloy axehead (NHER 28438) has been found. 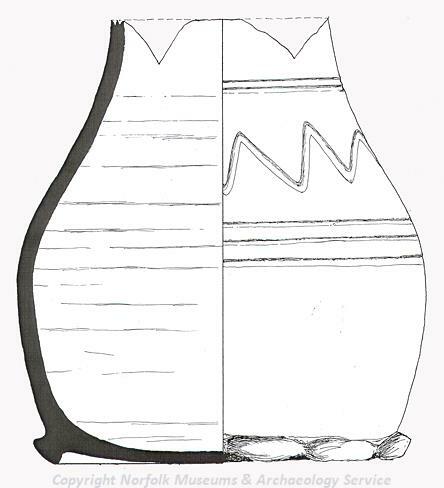 A three-way strap distributor (NHER 25854) may be Late Iron Age or Roman. It depicts a central Celtic style human head in relief. No Roman monuments have been recorded but Roman coins (NHER 20425, 20863 and 21842) found in the parish suggest there was activity here during this period. In one location an enormous hoard of over 2000 copper alloy radiate coins (NHER 32591) was recovered by a metal detectorist. These were probably deposited around 277 AD. Another interesting find is a military pendant (NHER 34539). There is little evidence for Saxon activity. Several Early Saxon brooches (NHER 21289 and 34051) and a buckle (NHER 31397) have been found. The round tower and west wall of the nave of St Margaret’s Church, Hardley (NHER 10367) date to the Saxo-Norman period, although most of the rest of the structure was built in the 14th and 15th centuries. It contains some wonderful medieval wall paintings. The other church in the parish, St Michael’s, Langley (NHER 10366) was built in 1310 although the building incorporated a Norman stoop. 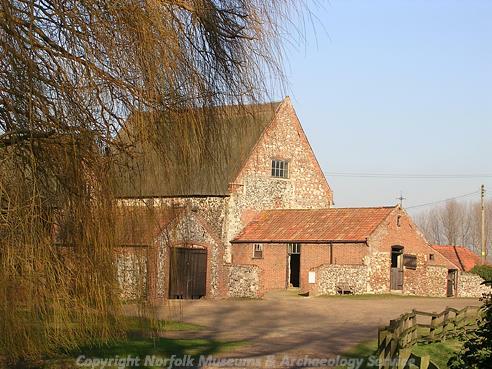 Langley Abbey (NHER 10344), a house of Premonstratensian Canons, was founded in 1195 by Roger Fitz Roger of Clavering. It housed fifteen to twenty canons and was dissolved in 1536. The site is enclosed by a moat. Parts of the 13th to 14th century cloisters, church, chapter house and infirmary survive. The Abbey may have been the site of the village cross, a 15th century stone cross (NHER 10326) that now stands at the junction of four parishes in Langley Park (NHER 30467). The history of the cross is rather muddled and it seems to have been moved around the village on several occasions (NHER 11729 and 17583). Hardley Cross (NHER 10424), possibly dating to the 14th or 15th century, stands and has always stood on the boundary of the jurisdiction of the cities of Norwich and Great Yarmouth on the banks of the Rivers Yare and Chet. It is a regular tourist attraction for visitors to the Broads. Another medieval boundary stone (NHER 10353) has a regular ghostly lady visitor who is said to wear a red dress and sit on the stone. The location of a medieval moat (NHER 21841) has been identified on aerial photographs. Cropmarks of a medieval to post medieval field system (NHER 36506) can also be seen. It has been suggested that Langley Park (NHER 30467) stands on the site of an earlier medieval deer park. An unknown medieval building (NHER 10347) has been located by recording a scatter of medieval pot and building materials. Other interesting finds include a complete 14th century green glazed jug (NHER 10343), three possible medieval iron arrowheads (NHER 12651) and a lead ampulla (NHER 31397) from Walsingham. The landscape was drained during the medieval and post medieval period and several drainage pumps (NHER 10357 and 10358) have been restored and can still be seen. The sites of other pumps (NHER 1359, 15946 and 37162) are recorded in old documents. One of these is the important Langley Roundhouse steam drainage pump (NHER 10359). Hardley Hall (NHER 12473) is an Elizabethan country house. Amazingly the front door dates back to when the house was built. The timber frame of a 16th century aisled barn (NHER 22794) has been preserved, standing on its original sole plates, although now on a modern concrete floor. Langley Hall (NHER 10362) was built by Matthew Brettingham in 1740 in Palladian style. This expansive hall is now used as a private boarding school. In 1738 a landscape park (NHER 30467) was laid out around the hall. Capability Brown drew up plans for part of the landscaping in 1765 but it is unclear whether any of these were executed. The icehouse (NHER 30468) in the park was bricked up in 1971. Unfortunately the 1987 hurricane did some damage to the trees. 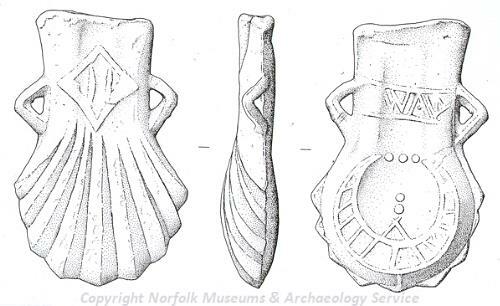 An interesting post medieval find is a pipeclay figurine (NHER 21249) of a man holding fruit surrounded by tendrils, garlands and flowers. Unfortunately his head and feet are missing so it is difficult to identify him. He may represent harvest or fertility. The most recent site recorded is a modern aeroplane crash site (NHER 19530). A Hawker Hunter jet fighter plane crashed here between 1945 and 1950. The engine of the plane landed on the doorstep of the nearby cottage Hazelmere. http://www.roll-of-honour.com/Norfolk/Langley.html. Accessed: 4 May 2006.
http://www.british-history.ac.uk/report.asp?compid=38300. Accessed: 4 May 2006.